This isn’t climbing specific (or even climbing related) but i only have one website so have nowhere else to publish it. Besides, it’s still interesting. When we have something we want to give a rating to, we drop it onto the line and it sits there with the rating we’ve given it. 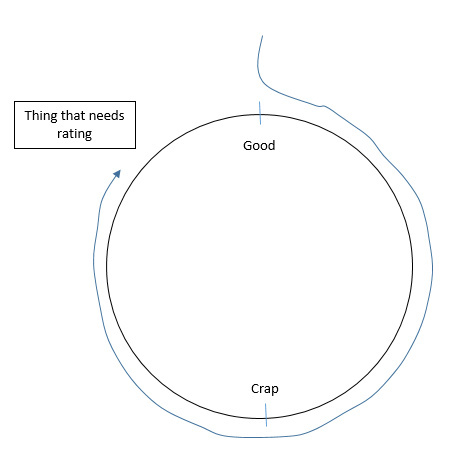 We can slide it up and down but it’s pretty simple: something is either good or it’s crap (because we rarely rate things as neutral anyway). See? 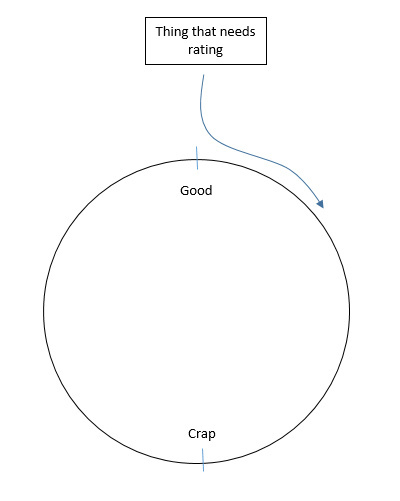 Pretty simple but it does go a long way to explaining how something can be so crap, it’s actually quite good. Feel free to pick whatever holes you like in this and comment to your hearts content. Or to laugh at me. Most people do that. Anyway, enjoy! Oh and sorry about the crude drawings.